The momma-to-be will most certainly appreciate this DIY diaper cake centerpiece that doubles as a gift, and it takes less time to put together than a regular cake! If you’re looking for a unique baby shower centerpiece then this will certainly get your guests talking and being amazed at your creativity. They will be jealous that they didn’t do something like this for their own baby showers. All you need is a punch bowl, blue Kool aid and some rubber ducks. Take a circle cardboard for the base of the cake.Stick the tissue holder in the center.Arrange 15 diapers on the base around the tissue holder.Wrap the polka dotted ribbon around th diapers.Stick the gray color onesie cutout in the center of the diaper cake. I bet you have never thought of having pumpkins at your baby shower before? This is a very unique but splendid looking baby shower centerpiece that you will have fun making. All you need are pumpkins, white paint, gems and ribbon. You can make one of these for each table. You can use blue flowers instead of pink if the baby shower is for a boy as blue will still look great with the limes although you can use other fruit such as lemons. All you need to create this classic centerpiece is a glass vase, plenty of limes and faux pink flowers. There can’t be anything simpler and cute than Disney dumbo party centerpiece. We bet your guests will go ‘aww’ over this piece. This centerpiece is extremely cute and it contains the main centerpiece and two additional small fish centerpieces. Invite everyone to the baby shower you are hosting with this creative DIY baby shower invitation that fits perfectly inside a small gift box. Adorn regular inflated balloons with small butterflies to create some easy but beautiful DIY decor for the party. In this case, you could use a classic Mason jar as a centerpiece, filling it with flowers or using it as a candle holder. If the baby shower is for a girl then this princess looking centerpiece will look amazing. The ‘body’ is made up of three diapers which can be tied together with ribbon and tiara. The skirt can then be made by fluffing tulle. Add pearls around the centerpiece for a finishing touch. How deliciously sweet will these DIY baby shower centerpieces look at your baby shower. Guests will literally want to take them home with them. What’s better is that they are so easy to make. All you need are some jars, plenty of sweets and faux flowers or even real flowers. You fill the jars up with blue or pink themed sweets depending on whether it is a boy or girl. Fill one-fourth of the bowl with water.Put the floating scented candles in the water and light them.Place small floating flowers in between the candles.Spread a bright red, pink, or orange color table spread to accentuate the centerpiece. If you would like a Mason jar centerpiece with a twist but don’t have the time or the will to do it yourself, this set of navy blue and golden painted Mason jars centerpiece could be the one you are looking for. Another amazing baby shower centerpiece suitable for a baby shower without a clear theme is this building blocks centerpiece. Floating scented candles bring in a bright and joyful ambiance to your baby shower. It takes less time to create and makes a great centerpiece. If you like the idea, a centerpiece to consider is this bouquet of 12 baby favor boxes. If you have more guests, simply arrange on the table more bouquets, paying attention to have one favor box for each guest. This is another baby shower centerpiece that will be put to very good use after the party is over so will certainly not go to waste. All you need to make this diaper bouquet is a glass vase, flower foam, mini baby products, tissue paper, bamboo skewers, 77 diapers per bouquet, clear rubber bands, tulle and lace. Cut out animal silhouettes in pastel paper and hang them on a string for a cute banner at the party and a simple baby shower activity for the guests. Invite all the guests to write a message with their wishes for the baby on an animal silhouette. This centerpiece is perfect for a shabby chic or elegant party, adding a touch of style even at the simplest buffet. If navy blue and golden is not your style, the manufacturer proposes numerous other colors. The frame is white and the manufacturer proposes multiple versions of signs that are suitable for both genders and even for those baby showers to which the gender of the baby is either unknown or unrevealed. Make any snack you serve at the shower fit the theme with some DIY onesie toothpicks, which you can stick into the tops of any appetizer. If you are pressed for time and small on budget, don’t worry – simple blocks, bears, and balloons can work as great decors for your centerpiece. No, I haven’t gone crazy! You can actually make some of the most charming little centerpieces with cucumbers as you can see in the image. You can create the stripes using a peeler and only scoop out half of the middle so the bottom is weighted to stand up. Your guests will absolutely love these cute and fun baby shower centerpieces. All you need to create these ready to pop baskets are skewers, tape, scrapbook paper, scissors, lollipops, baskets, crinkled shredded paper and ribbon. You can make the ready to pop sign in Photoshop, PowerPoint or Paint depending which you have and which you can do. The mommy gets all the attention at a baby shower. And her friends and family ensure that she has a time of her life! Which is why they get the best food, beautifully decorate the entire place, and give away some of the best return gifts. One of the most popular baby shower themes is the bath time. This important event in the life of the baby is usually characterized by the presence of all sorts of rubber toys, among which the most popular are the ducks. If you’re looking for something fun and unique for your baby shower centerpiece then the baby in bath centerpiece should definitely catch your eye. All you need to make this centerpiece is a vintage baby bath, clear gift filling, baby doll, rubber duck and towel. In fact, the Andaz Press baby shower centerpieces come not in two or three options, but in 171 different versions. 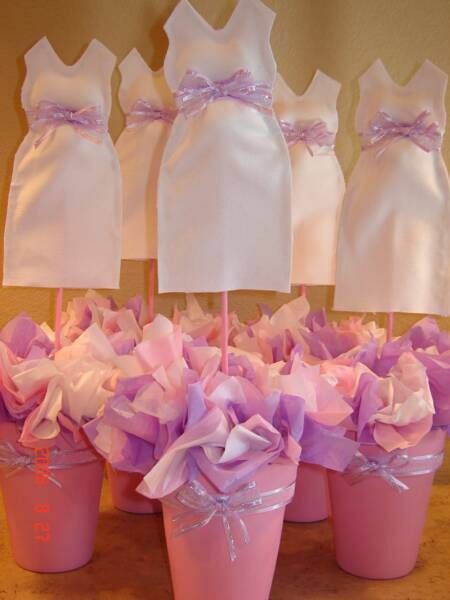 I have mentioned diaper centerpieces that are great because they will be put to great use after the party. This centerpiece is very unique as well as having great use after the party. All you need is to create cute baby outfits, hand them up on a hangar which will be glued to a stand. Perfect for a jungle themed baby shower, these animal cupcakes toppers are simply adorable. On the other hand, you can also choose this centerpiece if you don’t have a theme for your party, as it will certainly add a joyous note to the gathering. Thanks to its multi-colored pattern, the centerpiece could be the ideal choice for a baby shower when the gender of the baby is unknown, or if the mom-to-be doesn’t want to reveal it. Girls can never get enough of pink. So, here is yet another pinkish centerpiece. Keep everyone entertained by setting up a onesie painting station. All the guests can paint a plain white onesie for the baby. Stick the Minnie mouse cutout in the middle of the box.Cover the box with pink color papers.Make one hole each on the feeding bottles.Stick a dowel in the bottle.Stick the dowels on either side of the box. The centerpiece is easy to assemble and made of paper. Without a doubt, this centerpiece is an affordable solution if you are organizing a baby shower on a budget, yet avoiding to invest in a centerpiece with a cheap aspect. For some cute baby shower decor, place some of these DIY diaper snails around the snack table. Who said that a baby shower must be baby-themed? The first party of the future baby is more of a celebration of the mom-to-be, so choosing a more grown-up oriented theme is perfectly fine. Planning a baby shower for a boy? Here are plenty of ideas for baby shower centerpieces for boys. Some centerpieces require simple, everyday items. Here, we bring a list of simple and easy-to-make baby shower centerpieces. You just can’t go wrong with a fairy inspired baby shower which is why this Tinker Bell centerpiece is just so perfect. You can easily make this with a cage lantern, garland of flowers, battery candle, Tinker Bell stencil and glitter scrapbook paper. If you have Photoshop then you can use it to transfer the digital glitter paper onto the stencil and print a bunch out. All you need to make these delightful and very charming baby shower centerpieces are mason jars, baby blue or baby pink sand, tealight candles, and baby blue or baby pink ribbons. All you need to make them is to tie a piece of ribbon around the top of the jar, pour in a small amount of sand and drop in a tealight candle. 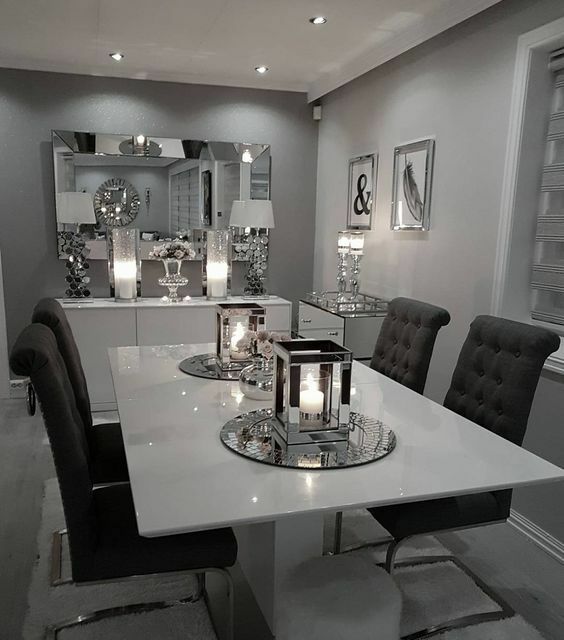 The dimensions are ideal for creating a beautiful effect on the table. The centerpiece is 14.5 inches tall, 8 inches long and 5 inches wide. Thank everyone who attended the baby shower by sending them home with cute fabric wrapped candles that take only a few minutes to make. If you are planning for a blue and gray elephant baby shower theme, then we have an idea matching that theme. Take a big block and stick the letters ‘BABY’ on all the four sides. If you don’t have a block, use a white cardboard box.Stick a teddy bear with a double tape.Blow a bunch of balloons and let the teddy hold the balloons with the help of a rod or glue the rod to the teddy. The Jungle safari theme is fun and reflects your adventure spirit. Fill the bucket with white crepe paper.Make a huge paper ball and stick pearls all around it. Remember to leave a small opening in the centre of the ball for the stick.Make a paper rod and wrap it with pink satin ribbon and end it with a bow. Attach this stick in the center of the ball.Place the stick in the bucket. 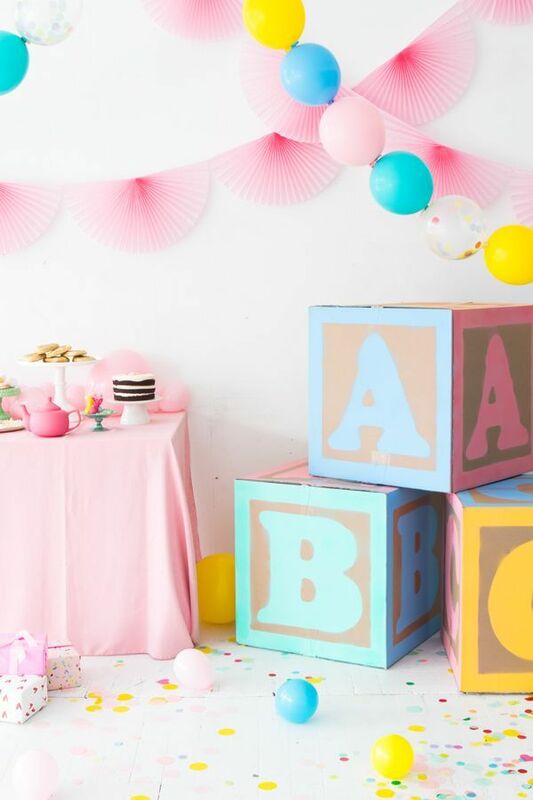 Decorate cardboard boxes to resemble giant baby blocks, which make the perfect decor for a baby shower and double as the perfect background photo prop. These would be so adorable in the background while the momma-to-be opens all her gifts. These pink and gold tulle baby shower centerpieces are ultra-cute and will look great at a baby shower for a girl. They are super easy to make and you only need Mod Podge, mason jar, gold glitter, tulle, straws and gold wands. Add Mod Podge to the bottom of the mason jar and pour in the gold glitter. Shake off any excess glitter and allow the glue to dry. There is something just so cute and fun about rubber ducks which is why they are great to use for your baby shower centerpiece. All you need to create this centerpiece is a fishbowl, broken Styrofoam for the base of the bowl, and gummy duck sweets to be placed inside clear balls. If you’re after something a bit different to the usual blue and pink cutesy and fun centerpieces then this would be ideal. All you need to create this classic chic baby shower centerpiece is a box, clipart ribbon, mix of faux flowers, faux berries, faux pine cone and glitter spray. You can use real flowers and pine cones if you want though. Use a wooden plank for the base.Write the letters ‘BABY’ one each on all the blocks.Decorate the blocks with stars and glitter papers on the sides.Arrange the letters one on top of the other and place it on the plank. There always seems to be something so magical and calming about the woodland which is why it is a great theme choice for baby showers. If you decide to have a woodland theme then this centerpiece will be perfect. All you need is a bunch of tasty treats and logs to stand them on. It’s time to get creative in the kitchen! Expecting your baby during winter? Then a snowman diaper cake centerpiece would be the perfect decoration to welcome your baby. The baby favor boxes bouquet comes in either pink or blue. Yet, if you don’t want to reveal the gender of your baby, it is quite easy to create your own favor boxes bouquet in the colors you like best. Making your centerpieces doesn’t have to be hard or expensive; in fact you can probably make your centerpieces for a lot cheaper than if you were to buy them. If you make a centerpiece from items that the mum-to-be can use after the party then even better! This should give you plenty of inspiration to start getting your DIY head on and create baby shower centerpieces that are masterpieces. Making centerpieces for baby showers can be so much fun as you can be as creative and silly as you want with them. Something as simple as rubber ducks can spruce up your baby shower and add peppiness to your theme. If the baby shower is for a baby girl then this gorgeous centerpiece will be sure to wow, however you can also do it in blue for a boy or even clear if the gender is not known. All you need to make this glittery pink vase centerpiece is a glass vase, paint brush, glue and confetti glitter. Brush a layer of glue onto the bottom of the vase and simple roll it in the confetti. This is certainly a very unique and fun centerpiece you can have for your baby shower. All you need to create this cute centerpiece is a white bucket, gold ribbon, red glitter hearts, cotton wool, skewers and cloud shaped card. You can add whatever colors and text to this to personalize it to you. Here are a couple of common decorations you need to know, such as making a diaper cake and paper flowers. Help all your guests find the location of the baby shower with a welcome banner on the front door. This printable banner is an easy DIY project. You may think that this centerpiece looks like it would be hard to make but it is actually very easy! Simply add water to a bucket and add your flowers and fruit. Insert a smaller bucket into the center of the larger bucket and add a bunch of stones to weigh it down. Put it into the freezer till the water if frozen. Together with the mother-to-be, help reveal the baby’s gender to all her family and friends by making some cute diaper cards. Everyone should open the cards at the same time to collectively discover the baby’s gender! If the idea sounds appealing, Andaz Press proposes a stylish framed party sign that can easily double as the perfect center piece. If butterflies are more your thing then this very cure baby shower centerpiece will be perfect for your baby shower. All you need to create these gorgeous centerpieces are helium balloons, balloon ribbon, craft paper, butterfly stencil, craft tissue and a jar or homemade picket fence to put it in. You can get craft paper and tissue in a variety of colors to suit the theme of the baby shower. Make three diaper cakes and arrange it in three layers.Tie them up with a rubber band so that it is firm.Wrap the bronze and golden color satin ribbon around the circular diaper arrangement.Put the golden stars in the top center of the arrnagement. Help the mom-to-be remember her baby shower with all her family and friends by making a homemade guest book. At the party, each guest can write their name on one of the paper balloons. Nevertheless, if you want to keep the gender of your baby a secret, you will be able to choose from a wide selection of differently colored Gleam ‘N Burst baby shower centerpieces. Without question, everyone at the party is going to want to take a photo of the cake and your handmade cake topper. To decorate the cake for the party, hang a mini clothesline made out of straws and string to hang tiny paper onesies as a cake topper. If you want to add a pop of color to your baby shower or are having a blue and lime themed baby shower then these simple yet brilliant centerpieces will do just the trick. All you need to create these aqua blue & lime green themed centerpieces are large helium balloons, smaller helium balloons, balloon ribbon, large weights and fabric to cover the weights. You will find in this list of ideas everything from baby shower flower centerpieces to unique baby shower centerpieces. It is time to get in touch with your inner DIY self and start getting ﻿to work on your fabulous DIY baby shower centerpieces. I have also made sure to include plenty of ideas for both baby shower centerpieces for boys and for girls too. Take as many boxes as you want.Stick a different color paper on all the boxes.Wrap the polka dotted ribbon around the box making a bow in the center.Make cone shapes with the colored papers and put them in the box. Pour some water and ice into the glass bowl.Add blue solution to color your water.Put the rubber ducks inside the bowl.Tie a ribbon around the bowl. Baby showers are always a party that happens when the mum to be is still pregnant and usually heavily. This is why it makes total sense to have these cute pregnant centerpieces at the baby shower. You need two different tones of glitter, Styrofoam to cut the shapes and plenty of tissue paper for the base. Are you planning a baby shower and are looking for the perfect baby shower centerpieces? Never fear, here are 41 easy-to-make baby shower centerpieces that will be sure to wow. You can use multi color blocks you have at home to create this centerpiece. It’s totally affordable and easy to make. A fantastic way to decorate the snack table, this craft transforms an ordinary globe into a chalkboard. From here, you can customize your message any way you want! All you need to make this very charming elephant themed baby shower centerpiece is a tin bucket, bags of peanuts, craft paper, elephant stencil, ribbon, button and a wooden dowel. You can cut out flowers shapes from the craft paper and layer them on top of each other. You can then cut out an elephant from the craft paper and add this as the top layer. Sometimes, the moms-to-be decide to announce the gender of the future baby at the baby shower. If you decide to let your family and friends know the gender of your baby at the baby shower party, this center piece will certainly help you. Has there ever been a more relevant flower to have at a baby shower that Baby’s Breath? This is another centerpiece that will go perfect in a woodland themed baby shower. All you need is log slices, pine cones, tealight candles, mason jars and Baby’s Breath. This is a girly and gorgeous baby shower centerpiece that is easy to make. How amazing will this baby shower centerpiece look at your baby shower or the baby shower you are planning? All you need to make these are mason jars, paper lanterns, lollipop sticks, hot glue, battery tealights and ribbon. You can find paper lanterns in both baby blue and baby pink for as low as $2 each. This stunning and bold centerpiece is perfect for a baby shower where the theme is favorite children’s books. All you need to make these amazing baby shower centerpieces are a ton of books, vintage vases and faux flowers. If you like, you can wrap the books in craft paper to match the color scheme of the baby shower. If you’re anything like me then you will absolutely love planning a baby shower. From choosing the theme to picking what games to play and from choosing decorations to picking what food to serve can all be very exciting. I have come across so many baby shower center pieces in my time which is how I have been able to get this list of ideas together. If you want to add a bit of wow factor to your baby shower while still keeping it fun and light then this DIY baby bottle sprinkles centerpiece will be perfect. All you need to create this cute centerpiece are clear baby bottles, sprinkles, big lollipops, any kind of candy, super glue, ribbon and duct tape. If you decide to throw a bath time themed baby shower party, the Bubble Bath Baby Shower Honeycomb Centerpiece will certainly be the perfect match. Sometimes, the best centerpiece is a sign clearly stating that the buffet table is full of sweets and treats waiting for the hungry guests to taste them. For baby boys, the manufacturer proposes an all-blue centerpiece while for the baby girls there is available an all-pink version. Arrange the folded diapers in a pan. Continue arranging the diapers in the pan until you get a swirl shape.While the diapers are still in the pan, wrap it with rubber bands. You will get a tire like shape. Take the diaper tire from the pan and put it on a flat surface.Create another diaper tire in a pan in a similar manner. Place it next to the other diaper tire.Wrap a decorative ribbon around both the tires and pin it up. Fold a big napkin lengthwise and make a tight roll and pin it.Slide the rolled napkin into the center of the diaper tire.The napkin roll must hang out on either side equally.Stand the diaper tire on its side. Run the napkin roll from the first diaper tire to the second one.Align the tires in the same line so the base of the motorcycle is strong.Tuck the end of the napkin roll into the hole of the second diaper and pull it tight. Pin the napkin roll so that it holds both the tires firmly.Fold another napkin lengthwise similar to the first one.Place the napkin into the opening of the front tire.Slide the napkin fully through the hole until both ends meet. Pin the bib on the front diaper tire.Hold the ends of the front diaper tire napkin upward.Slide the ring through the top so they hold the two napkin ends.Slide the toy until it is way down to the diaper tire. Insert the bottle above the bib and below the ring.Slide a rolled-up cardboard inside each handlebar to make it stiff.Stuff the socks with tissue paper.Cover the handle-bar with socks on two sides and pin it up. Cover the back diaper tire with a bib.Put the teddy bear in the middle of the two tires and pin it up to prevent it from falling. 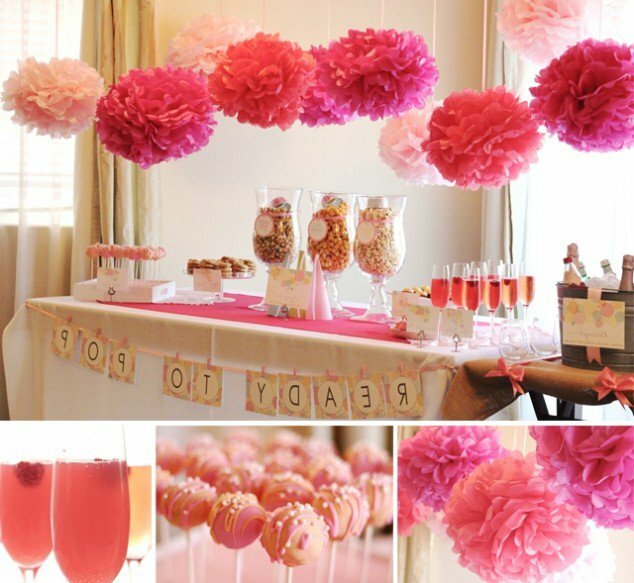 Get ready for a baby shower with these DIY party ideas! Here are 20+ DIY ideas to help you host the best baby shower ever, including invitations, decor, and snack ideas. If you have exhausted all the creative ideas, then don’t worry. As we still have plenty of options in our kitty. Decorate cupcakes for a baby shower by topping them with DIY pink and blue balloon cupcake toppers made out of cardstock and paper clips. One fun idea would be to fill the cupcakes with either a pink or blue frosting so when everyone bites into the cupcakes, the baby’s gender would reveal to all the guests at the baby shower! To throw an unforgettable baby shower, you must also pay attention to details. And since the eyes of your guests will be focused on the buffet table, you should decorate it with care. This is such a truly stunning and gorgeous baby shower centerpiece that is incredibly easy to make as well as not being too heavy on the budget. All you need to create this wonderful girly baby shower centerpiece is a glass vase, ribbon, clear gift box filling and plenty of tissue paper. You can also use floral foam to make sure the tissue paper stay in place. This is an incredibly sweet baby shower centerpiece that will certainly not go to waste once the baby shower is over. All you need to create this sweet and simple centerpiece are faux flowers, 8 diapers per centerpiece, rubber bands, scissors, one roll of yellow and pink ribbon per 4 centerpieces, and a hot glue gun. We hope that now you have plenty of ideas for creating and decorating centerpieces for your baby shower. The decoration of a party does go a long way in remembering how the party was. So, decorate to steal the mommy-to-be’s and guests’ hearts away! These will look very classy and elegant at a baby shower if that is the theme you are going for. All you need to make one of these water themed baby shower centerpieces are large jars, smaller jars, water, blue or pink food dye and candles. Simply place the smaller jar into the larger jar, pour in the dyed water in between the jars and place the candle in the smaller jar. Place the baby products in an empty vase.Roll the diapers and tie it up with rubber bands at the base.Tie all the rolled diapers with a metal wire and stuff it into the tissue holder and put it in the vase. This centerpiece is easy to make and can be of good use after the party. Take a shoe box or any rectangular box for the base and cardboard circle shape for the cake base.Make three-tiered diaper cake.Wrap the blue ribbon around each layer.Stick a button in the center of the ribbon. For the snowman decoration: Stick black circles for eyes Use one small, black circle for the nose Stick the pacifier below the nose Put the cap on the ballStick a brown color tweak behind the cake. You will be surprised as to how easy this gumball baby shower centerpiece is actually easy to make. All you need is a plant pot, glass fish bowl, plant pot tray, doll pin stands and gumballs. The painted plant pot will sit upside down with the fishbowl glued on top and the plant pot tray sitting on top of the fish bowl. We are sure everyone will be bowled over your cute motorcycle diaper centerpiece design!! Paint plain wooden peg dolls to look like a family of animals with this cute DIY project that is perfect as a cake topper for your friend’s baby shower. You can’t get a much easier centerpiece than to buy a load of small honeycomb balls in two to three different colors and to stack them on the table as the centerpiece. As a finishing touch, you can add mini potted plants around or along the honeycomb balls. In the cane/wooden basket, put the soft toy.Attach four dowels on four sides of the basket.Decorate the ball with the ribbon. Make bow shapes with the satin ribbon and stick them on the ball on all sides. Glue the ball to the dowels firmly. Your dumbo centerpiece is ready! Get a normal pot and paint it pink or if you can get a readymade pink pot, that’s great.Make rosettes with the foam papers of all colors and put it in the pot.Snug the green tissue paper in between the cupcakes. The Gleam ‘N Burst Centerpiece can easily replace a traditional flower bouquet creating a bouquet that reveals if you’re going to have a baby girl or a baby boy. It seems to be a lengthy process, but it is simple once you start making it. You simply can never have too many diapers when you have a baby on the way which is why it makes sense to use them for your centerpieces so you can make good use of them once the party is over. You can bunch together some diapers, add plenty of ribbon and tulle on top and create a big badge on the front. If you love all things cupcakes then there is no better way to celebrate your baby shower than with cupcake (or baby shower cake) centerpieces, your guests will absolutely love them. To make this you will need a tin bucket, label tag, ribbon, floral foam, skewers and cupcakes. Stick the skewers through the center of each cupcake and stick to the floral foam. Between the arrangement of plates and trays, you should also place a beautiful baby shower centerpiece that can match the theme of the party. There are many DIY ideas, but if you lack inspiration or skills, we selected seven awesome baby shower centerpieces for you. Check them below. If you or the person you are planning for is a bit of an indie chick then you or they will love this bohemian themed baby shower centerpiece. They are so easy to make and to capture a true bohemian look, be sure to mix match the vases. You can have vases in all different shapes sizes and colors. Who wouldn’t love this fabulous and very unique baby shower centerpiece? All you need to make this unique baby shower centerpiece is tissue paper, Styrofoam, stencil of a stork, stencil of a bag, black glitter and white glitter. You can use the white glitter for the body of the stork and the black glitter for the tail and to highlight features. These DIY individual-sized candy bags are sure to be a hit at any baby shower. Baby shower favors are a great way to thank your guests for attending the party. To keep the favors together until the end of the event, you will probably need a bucket or a beautifully decorated box. And since you also need a centerpiece, why shouldn’t you use a bouquet of baby favor boxes as a centerpiece? Looking for baby shower centerpieces for girls? 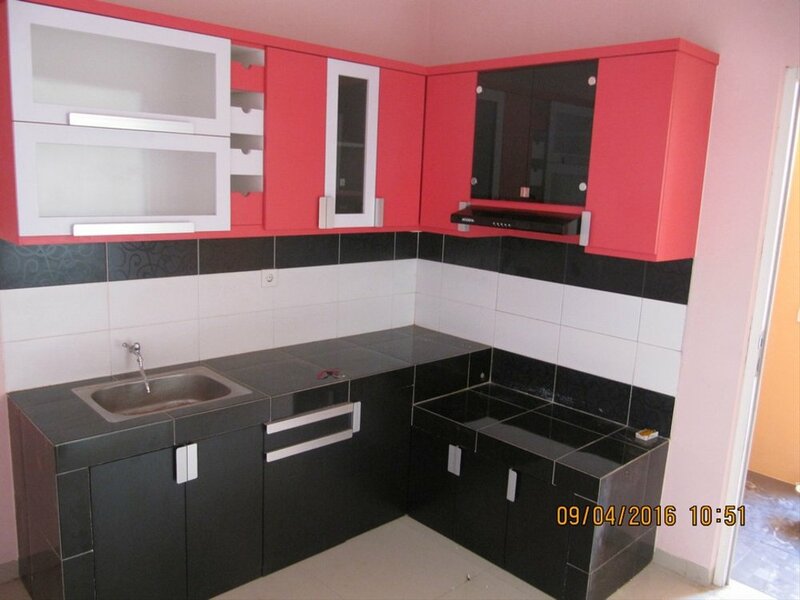 Here are plenty of beautiful ideas for you. You can personalize them according to your baby shower theme. If you have more ideas, do leave them below in the comments section. Create candy-filled baby block party favors with this easy DIY. Decorate clear boxes with a printable baby block template that you can glue to the exterior of the treat boxes. The completed candy baby blocks can be stacked on tables at the baby shower and double as party decor. The centerpiece is easy to assemble and it matches perfectly with a wide variety of Noah’s Ark baby shower decorations, including single use plates, napkins, and other essential party items, including baby shower invitations and games. Just like your cupcakes, you can create and decorate a similar cupcake centerpiece for your baby shower. 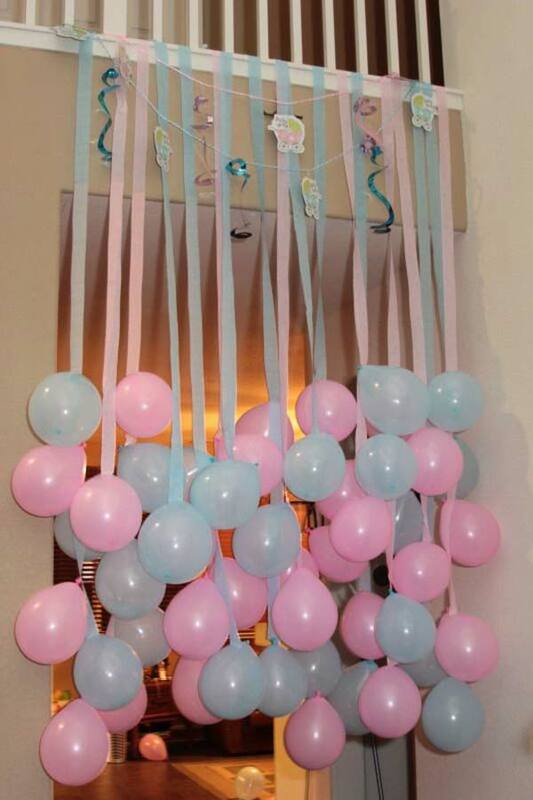 Decorate the baby shower you are hosting with some cheerful and fun party decor: take regular white balloons and enhance them with acrylic paints in soft pastels. The complete set of balloons can be clustered together around the snack and gifts tables. At a baby shower, like at any other party, the buffet will certainly be the center of attention. Your guests will expect to taste some delicious crackers, sandwiches, or cakes at the party, but filling a table with delicacies is far from being enough. To make your baby shower a great experience, one that you and your guests can cherish forever, you need to have an excellent decoration. And, it should have vibrant colors, an eye for detail, and a mix of life! There are plenty of ideas out there for centerpieces, but if you are pressed for time and still need the creativity, then MomJunction comes loaded with a list of the best centerpieces for a baby shower. Have a look! 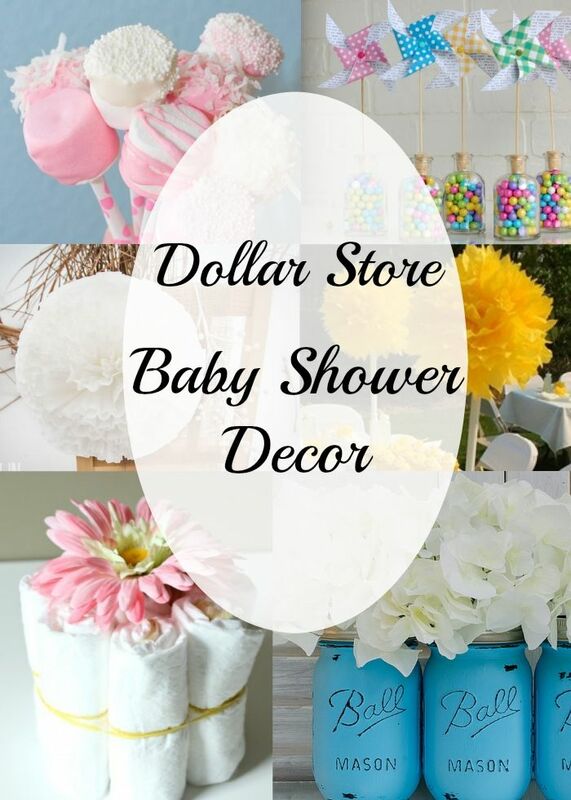 Whether you’re planning your own baby shower or planning it for someone else, finding the perfect centerpieces for baby shower can be hard and not to mention expensive. One of the best centerpieces I have come across are those that have been handmade which is why I have put together a list baby shower centerpiece ideas that you can easily make. Surprise your party guests with some adorable cupcake push pops. Pick from a variety of clever label ideas! Making your centerpiece needn’t be expensive. In fact, you can make the centerpiece with stuff you have at home or have bought from dollar store for cheap. Wrap the blue ribbon around the wooden box.Fill the box with blue netted fabricSnug the stick in the center of the box.Blow the balloon and tie it at the top of the stick.Prop the teddy bear on top of the box, it should appear as if it is holding the balloon stick with both hands. Cover the balloon with the netted fabric. If you choose either a jungle or Noah’s ark baby shower theme, then a great centerpiece to consider is the Noah’s Ark Honeycomb Centerpiece Set. You can create a very similar cupcake centerpiece for a blue themed baby shower by having a blue and white polka dot plant pot (you can buy a normal plant pot and paint it) and having blue tissue paper to snug in between the cupcakes. Minnie mouse has to feature in the list of baby shower centerpieces for girls, and so here it is. There can’t be a sweeter centerpiece than this, I mean literally! Sweets, candies, gummies, and toffees for your baby shower centerpiece. The Winnie The Pooh theme seems to be such a popular choice of theme for people to choose for their baby showers. If you are also having a Winne The Pooh themed baby shower then you need this centerpiece. All you need to make this cute centerpiece is a potted plant, black paint, yellow paint, garden wire, and honey and bee themed clipart. If you’re having a tea party themed baby shower then this will be a great choice of centerpiece for you. It is so very cute and very classic which is just what you want for a tea party. You just need to get some mason jars and some coral colored flowers. I can’t have a list of baby shower centerpieces without having a Minnie Mouse themed centerpiece. To make this centerpiece, you will need Styrofoam balls both large and small, black shimmer spray paint, wooden dowels, plant pot to be painted pink and white, tissue paper, ribbon and glue gun. This simple craft is an adorable baby shower centerpiece and doubles up as a things holder later. The centerpiece is perfect for both baby boys and baby girls and is characterized by an aqua-colored base decorated with soap bubbles and two lovely ducks. Thanks to the honeycomb pattern, you can even use the centerpiece as support for decorative party labels and signs.